Nashville, Tenn. (September 27, 2013) - Rock newcomer WE AS HUMAN has enjoyed a thrilling ride so far in 2013 following the release of their debut, self-titled album WE AS HUMAN in June of this year. The album was greeted with nearly unanimous praise, calling the band "perfect" and "the epitome of what rock music is missing these days." The album shot to the Top 10 on the iTunes® Rock Chart and peaked at No. 31 on the iTunes® Overall Chart. Their lead rock single "Strike Back" enjoyed a steady climb to the Top 5 on the Christian Rock radio chart where it stayed for three weeks. The single also gave the band their first major award nod, a GMA Dove Award Nomination for Best Rock Song of the Year. Their single "We Fall Apart" exceeded expectations as well, spending two weeks in the Top 10 on the Christian Hot AC/CHR chart. Celebrating the smash success, the band toured heavily over the summer, bringing their thrilling live routine to audiences across the nation. 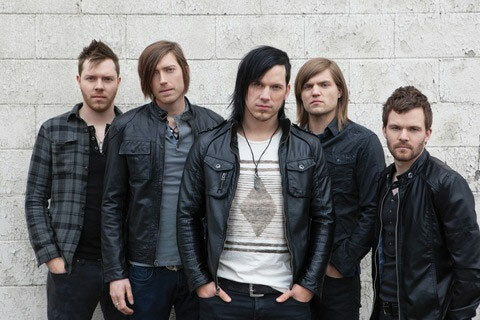 The band opened for acclaimed rock acts Shinedown, Papa Roach and Skillet on the 2013 Carnival of Madness Tour, during which they saw massive increases in their social tribe, more than doubling their fans and followers on Facebook and Twitter. Furthering their rigorous and impressive touring plans, WE AS HUMAN has announced that they will join the Self Inflicted Tour with Filter, Red and Otherwise in October and November in select cities coast to coast. For full tour dates and more information, see below. WE AS HUMAN has also announced that they will join Family Force 5's Christmas Pageant Tour between Thanksgiving and Christmas, for which dates will be announced soon. WE AS HUMAN signed to Atlantic Records via Hear It Loud, a partnership helmed by John Cooper of Skillet, manager Zach Kelm and attorney Todd Rubenstein, in 2011 after they were discovered by Cooper. Made up of musicians Justin Cordle, Jake Jones, Justin Forshaw, Adam Osborne and Dave Draggoo, the band toured heavily at the start of their major label career, performing before sold-out shows on the "Awake and Alive" Tour with Skillet, Winter Jam 2012, "Release the Panic Tour" with RED and the Carnival of Madness Tour in 2013. Their debut album WE AS HUMAN released in June 2013 and was declared the "epitome of what rock music is missing these days." Their single "Strike Back" was a Top 5 hit on the Rock charts and was nominated for the Best Rock Song of the Year for the GMA Dove Awards 2013.